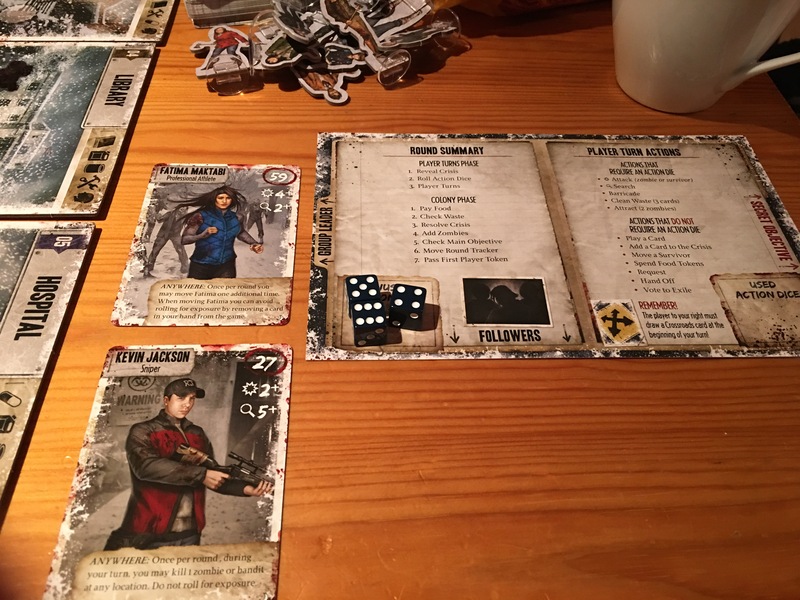 I like Dead of Winter. I don’t LOVE the game. It’s good. It’s very good but there’s so many very good games out there this game often gets overlooked. 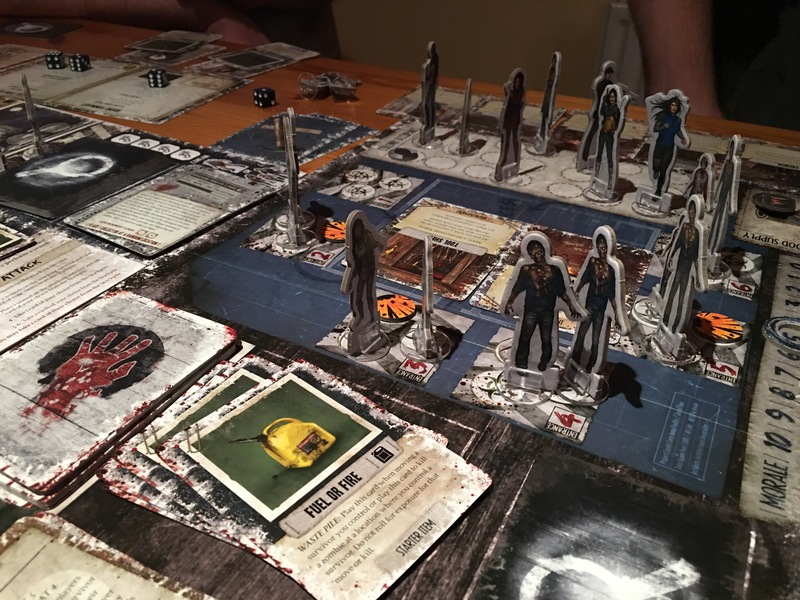 Enter Dead of winter long night. Last Thur to be precise. It’s a stand alone expansion. Let’s be more accurate. It’s Dead of Winter 1.5. It can be played with the first version but I didn’t see a reason to. It’s already got all the elements of the original with a number of extra rules and locations added on. I say added because it doesn’t feel like a bolted on expansion. It feels like a revised version of the base game. Everything from the base game is there but there’s just more to do. 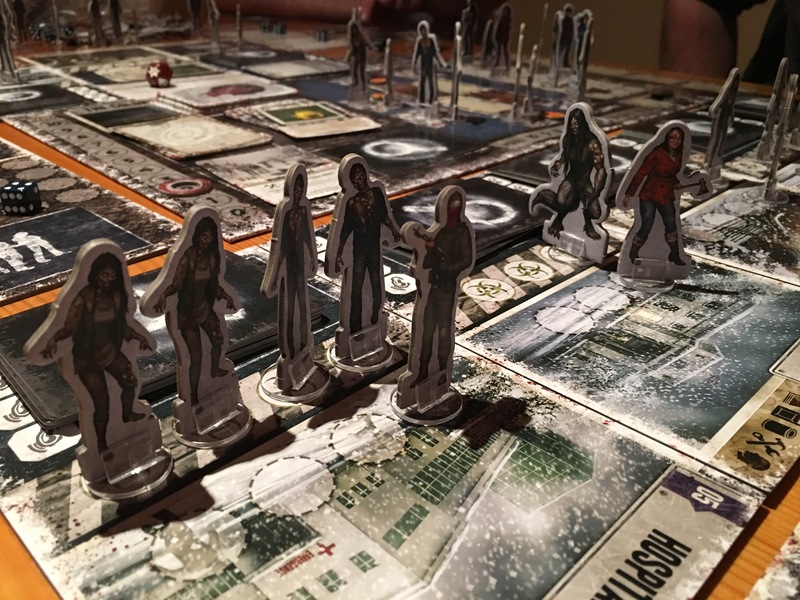 If you’re not familiar with Dead of Winter. It’s a semi coop with a possible traitor in there. Every player starts with a secret agenda they need to complete to win the game for themselves. They also have to win the group objective drawn at the start. Usually these individual agendas don’t conflict terribly with the group objective unless you draw the traitor objective and you want the group to fail. In which case it is as ever oodles of fun. The game sees players protecting their compound, trying to gather resources and control zombie incursions over a number of turns until they complete their mission. It’s set in Winter and frostbites as well as zombie ones are a constant danger. Like every zombie game it looks straightforward at the start then something unexpected happens, it all goes pear shaped and half of you are zombie chum with a mission still to do. The map is made up of a central compound and a number of key locations nearby like the police station, school, library and so on each containing resource cards and themed to that location so you’re more likely to find weapons in a police station than a library and so on (or at least I don’t think it’s set in America). Ok that’s the base game in a nutshell what long night adds is extra benefits and hazards. A new location Raxxon corporation has been added. These rascals are the ones responsible for the zombie outbreak in the first place and what’s worse their location needs to be minding or it spits out nasty weaponized zombies like hunters and witches. These are much harder to kill and more bitey and stabby than the normal Zees. The flip side of raxxon is searching there can turn up super weapons like plasma shields and warp cannons (actual names may vary). 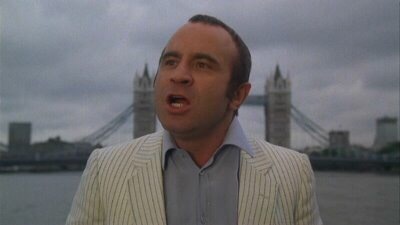 Another feature is the bandits. These turn up and stand around like father stone at various locations and if a player gets kicked out of the compound for being a dickish traitor they get to use these guys for their own gain. The bandit hideout is another visitable spot that accumulates face up cards which can be pilfered. All in all I found long night good. Not excellent. I forgot how many tokens and cards were in this game. A few more have been added.